The 2016 Dodge Durango is a rugged crossover SUV that’s known for its three rows of passenger space, high-tech infotainment gear, and world-class safety. The cabin provides rich interior comfort and style. 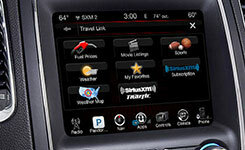 Advanced features, like smartphone integration, help you feel at home on the highway. On the road, the Durango delivers a strong, smooth ride and excellent towing utility. All-wheel drive enhances performance over light trails and weathered pavement. 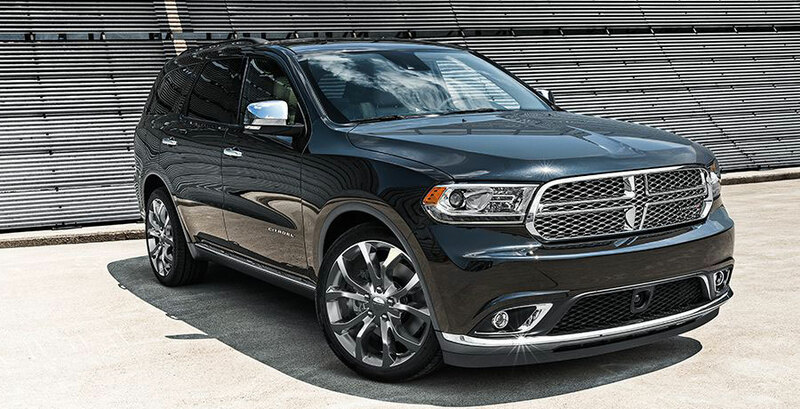 The 2016 Dodge Durango cabins is one of the best out there. All three rows of seating provide adult-friendly space – a rarity in this segment. This means that all passengers enjoy substantial head- and legroom. Elegant leather upholstery takes comfort to new levels. The Durango’s rear doors open almost 90 degrees to make ingress and egress a simple task. The flip-and-fold second-row seat also helps passengers settle into the third row. Behind the second row, you can fill 47.7 cubic feet of cargo space with your daily necessities. Flip down both rear rows for 84.5 cubic feet of maximum space. This crossover is handsomely equipped with tech and convenience features. Keyless entry and ignition certainly make your life easier, saving you plenty of time in the parking lot. Heated mirrors keep the morning frost at bay. The central Uconnect infotainment system keeps you up-to-date, with features like traffic, weather, and smartphone integration. The dual-screen rear entertainment system lets passengers play two different options, such as a movie and video game, simultaneously, so there’s never any argument over how to stay occupied. When it comes to passenger protection, you can count on the Dodge Durango. The Insurance Institute for Highway Safety gave the Durango its top score of “Good.” In government crash tests, the Durango earned an excellent four out of five stars for overall protection. The Durango’s high-tech features help you stay safe. Before you back out, the rearview camera helps you spot obstacles in your driveway. The Uconnect system includes emergency telematics features, including on-demand roadside assistance and automatic collision notification. Advanced systems, like forward collision warning, monitor your surroundings and alert you to potential problems. The Durango supplies plenty of rugged power. Properly equipped, this crossover tows max loads of 7,400 pounds, making it a great pick for your next outdoor adventure. The Durango combines a strong performance with generous fuel economy. When you’re stopped in traffic, the stop-start system automatically shuts the engine off to help conserve fuel. The eight-speed automatic transmission adds to the engine’s responsive performance. Choose all-wheel drive for maximum traction over off-road trails and icy pavement. The Durango R/T offers stunning style and generous performance upgrades. The sport-tuned suspension increases the Durango’s athletic ride. Inside, upgraded leather upholstery enhances passenger comfort. You’ll love the Beats audio system, with its thumping base and sharp clarity. The central system offers smartphone integration and real-time traffic reports. Play video games or watch your favorite DVDs on the go. Tow up to 7,400 pounds without putting a strain on performance. There’s plenty of room for the whole crew. When you crave rugged power and rich interior comfort, there’s no better choice than the 2016 Dodge Durango. This crossover SUV provides three rows of seating, with plenty of space for the entire family. High-tech infotainment options keep even very young passengers entertained for hours on end. The Durango’s safety lineup delivers the protection you require. On the road, the Durango offers a strong performance and impressive towing capabilities. Take the Durango on a test drive today!